Trenton TC (NJ)'s Athing Mu has quickly risen the ranks as one of the top 800 runners not just in the present day, but all-time. 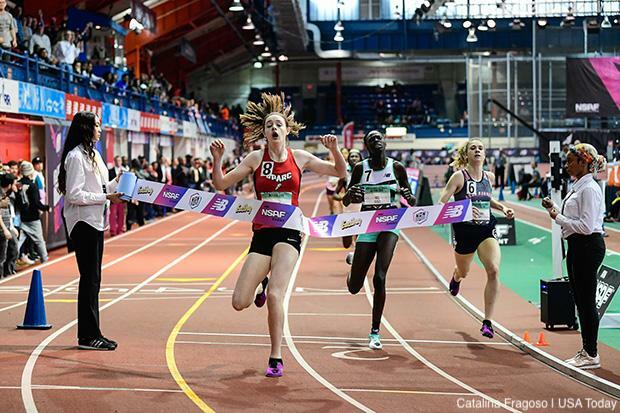 Her winning another national title on Sunday was almost a foregone conclusion. Unfortunately for her, Steven's Point (WI) freshman Roisin Willis did not seem fazed by her stardom. Mu, the owner of a 2:03.98 personal and season best -- nearly three seconds ahead of the next closest competitor -- nearly had the victory in the bag until Willis slipped around her with 50 meters to go and slammed the door shut. Willis's 2:05.70 is a freshman national record, US No. 2, and made for an incredible race on Sunday. Wisconsin is not done with their indoor season just yet, so we could see her drop even more time on the indoor track, but after watching her run pull down three sub-2:10 victories this winter, we could be in store for something very special over the next few years. It was a battle of the Keystone State natives to the line in the Girls 1 Mile Championship, but in the end, it may not have been the one we expected grabbing the gold medal. Northern (PA)'s Marlee Starliper entered the race with the top seed time: a US No. 2 4:41.66 personal best. The field also included US No. 3 Victoria Starcher (WV), US No. 4 Taryn Parks (PA), and US No. 6 Isabelle Goldstein (PA), among others. Nobody was within 4 seconds of Starliper, though, and she appeared to be the favorite for the victory. As the race unfolded, it appeared that the race would be much closer than anticipated. Starliper took over the race at the 1000 meter mark, but did not create much separation. Parks finally made her move heading into the final lap, separating herself from the rest of the pack, but Starliper covered the move and both girls were in a full out sprint to the finish. By the narrowest of margins, the race went to Parks -- 4:39.045 to 4:39.048. It was a 5 second personal best for Parks and couldn't have come at a better time. Starcher finished third in 4:40.63 with Zofia Dudek (MI) in fourth in 4:44.88 and Lucy Jenks (MA) in fifth in 4:45.93. 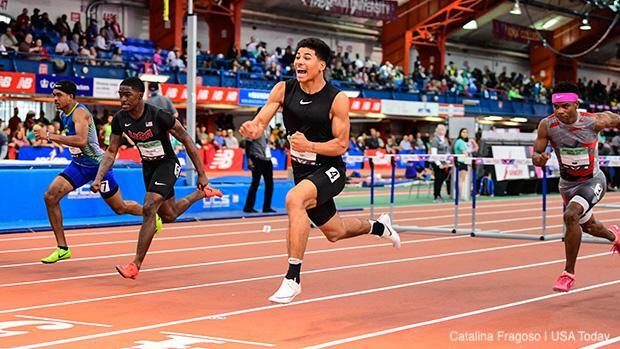 For much of the year, the 60m hurdles had belonged to Oscar Smith (VA)'s Kurt Powdar. Powdar entered the weekend with a US No. 1 (7.61) 0.18 seconds ahead of the next closest athlete. But on Sunday, the hurdles would belong to St. Augustine Prep (NJ)'s Sincere Rhea. Rhea entered the weekend with seventh fastest time in the country, 7.88, but left it with the second fastest time and the only other athlete to break 7.70 so far this winter. Rhea benefited from a misstep and DNF by Powdar in the finals, but had already shown that he was the real deal after winning the semi-finals in 7.73 and throwing down said US No. 2 7.64 in prelims. Rhea returns to the outdoor track with personal bests in the 110m Hurdles in 13.74 and will be eyeing another national title in North Carolina. Western Branch (VA) was all over the awards stand from start to finish this weekend. It started with their 4x55 Shuttle Hurdle Relay victory and national record on Saturday morning and ended with a major upset in the 4x400 relay. 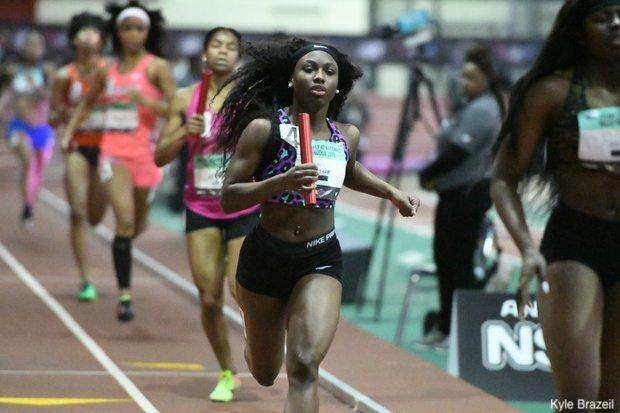 The team of Na'Taja Ballard, Adriana Shockley, Shardonnay Nichols, and Nylah Wiggins stunned the field with a US No. 2 3:44.97, taking down the fifth best squad in the country Neumann Goretti (PA) and the far and away best squad in the country Bullis School (MD). Bullis entered the weekend with a four second advantage over the rest of the field, but could not hold off the Western Branch charge. 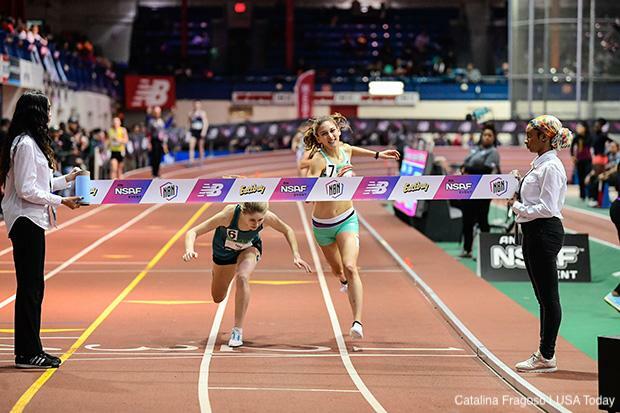 The ladies capped off an impressive weekend and have staked their claim as one of the most impressive sprint squads in the nation.